THE THORN IN THE HEART (L'Epine dans le Coeur) is a personal look at the life of Gondry family matriarch, Michel's aunt Suzette Gondry, and her relationship with her son, Jean-Yves. Michel examines Suzette's years as a school teacher and her life in rural France. During the course of filming the documentary, Michel unearths new family stories and uses his camera to explore them in a subtle and sensitive way. 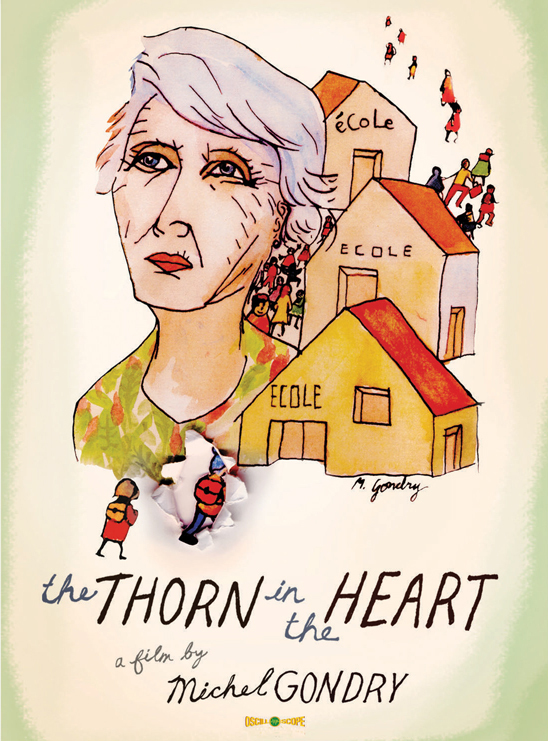 THE THORN IN THE HEART had its world premiere screening in the official selection at the 2009 Cannes Film Festival. Michel Gondry began his filmmaking career directing music videos for such artists as The White Stripes, The Rolling Stones, Beck, and Daft Punk, among others. In 2001, Gondry made his feature-film directorial debut Human Nature from a screenplay from Charlie Kaufman. After working with Kaufman again on the Academy Award-winning Eternal Sunshine of the Spotless Mind, Gondry went on to write and direct the films The Science of Sleep and Be Kind Rewind, and direct the documentary concert film Dave Chappelle's Block Party. DVD collections of Gondry's exemplary music videos and commercials were released in 2003 and 2009. He has recently authored a guide for DIY filmmaking entitled You’ll Like This Film Because You’re In It: The Be Kind Rewind Protocol and a comic book "We Lost the War but Not the Battle," both published by Picturebox. He is currently in pre-production on The Green Hornet, a feature film about the iconic superhero that will star Seth Rogen, to be released in the summer of 2010 by Columbia Pictures. A Brief History of the Harkis. Calendars Doodled - one year of drawings by youngsters. Stop motion animation by Gondry collaborator Valerie Pirson. Post-screening Q&A with Gondry at SXSW premiere. In Conversation - A special event with Michel Gondry at SXSW Film Festival.